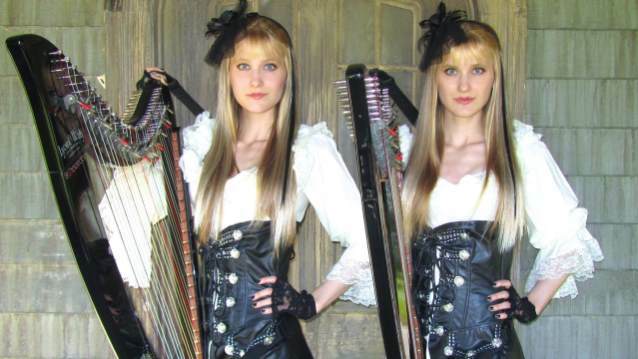 Identical twins Camille and Kennerly Kitt have covered the IRON MAIDEN classic "Dance Of Death" as an electric duet harp arrangement. Check it out in the YouTube clip below. Camille and Kennerly are known for their remarkable duet harp arrangements of songs by artists such as GUNS N' ROSES, LED ZEPPELIN, METALLICA, AEROSMITH, AC/DC, DEEP PURPLE and many more. The twins also arrange and perform a jukebox of Broadway, video game, TV and movie soundtrack hits. In addition to being prolific arrangers, Camille and Kennerly compose and perform their own original pieces for harp duet. In December of 2013, Camille and Kennerly released their much-anticipated first cover albums, "Harp Attack", featuring 14 of their most popular rock and metal arrangements, and "Harp Fantasy", featuring 14 of their most popular TV and movie soundtrack, anime, and video game arrangements. Camille and Kennerly began posting harp duet music videos of their rock, metal and contemporary cover arrangements on YouTube several years ago. The twins have since acquired over 14 million total views on their 100 percent independently produced videos in addition to amassing legions of fans worldwide — including over 100,000 YouTube subscribers and over 100,000 Facebook fans. Camille and Kennerly are known for their personal interaction with their fans — responding to more fan messages and comments than any other artist of their echelon.